According to Dr. Modi, his resort is ideal for weekend getaways, conferences, seminars, training programmes and rejuvenation packages. Dr. Modi’s Resort is spread across 50 acres, has 40 air-conditioned rooms set up in cottage style with its own private patio and garden. A swimming pool with a walk through Jacuzzi with a walking track and cycling path. To keep the children entertained there are indoor and outdoor games. There are no non veg meals available at Dr. Modi's Resort although there is a choice of North Indian, South Indian, Gujarati, Chinese and Continental cuisines vegetarian meals. Keeping in mind the corporates, Modi's Resort offers a variety of conference rooms that can hold 20 to 100 people. All the conference rooms are designed functionally and equipped with audio visual facilities. More importantly Dr. Modis' Resort offers a wide range of health treatments, lets take a look at some of them. Osteopathy is a system of medicine that has a strong emphasis on the inter–relationship of the body’s nerves, muscles, bones, connective tissue and organ systems. The healing power of nature is the central principle of Naturopathy, it offers a holistic approach to help the body in finding its own way back to a natural state of health and well being. Primarily a family of spiritual practices that have originated in India, now spread across the world as a path to enlightenment. Yoga at the Resort greatly improves the overall well being of each practitioner. A huge range of treatments are available at Dr. Modi's Resort they include Soft Tissue Massage, Whole Body Wet Sheet Pack, Wet Sheet Pack for the Chest, Wet Sheet Pack for th Abdomen, Body Mudpack, Mud Pack for the Eyes, Mud Pack for the Abdomen, Colonic Enema, Hot ‘Foot - Bath’, Hip Bath, Sauna Bath, Spinal Bath, Thermoleum and Yoga Therapy. Group bookings for morning to evening day use at Rs 650 per head - Includes Breakfast, Lunch, Evening Tea and Snack. We have been talking about things to do in Karjat, but you cannot do things if you do not have a place to stay. So the next few articles we will talk about places to stay to suit every budget. 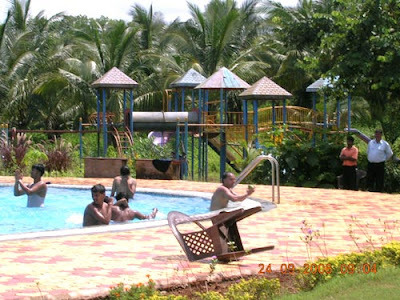 Satya Resort spans 52 acres of greenery and is located after Kadav village. Satya offers 34 spacious rooms with high wooden ceilings and attached bathrooms; some with air conditioners, all the rooms have an individual sit-out and garden. 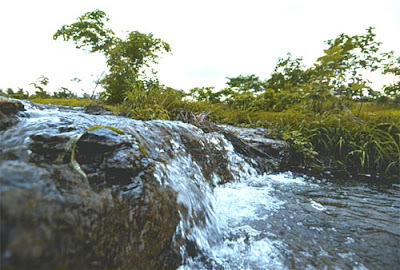 A Meditation Centre overlooks the beautiful Paej river and the hills beyond. The Health Club comprises of a Gymnasium & Unique Natural Sauna, Steam & Jacuzzi. And if you want to be connected to the outside world, cable television and telephone/intercom facilities will help to keep you in touch. An in-house laundry service is available and there is also a doctor on call. 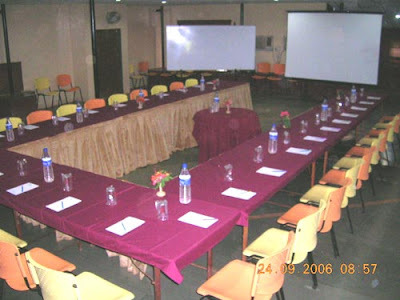 Two conference rooms are available one can seat 55 to 60 people in ‘auditorium style’ and 25 to 27 people in a ‘U-shape’ configuration and the other can accommodate 150 to 175 people and 60 people respectively, making it feasible for an outdoor corporate meeting. If you are are corporate you can also plan an outdoor adventure for your employees. Satya Resort in Karjat also has a Kerala Ayurvedic Massage that costs Rs.500 and last for approximately 35 minutes. The tariffs are on the steeper side and would prove to be too expensive for trekkers and people looking out for adventure, but for families to enjoy a relaxing weekend. Here's the map to get to Satya Resort if you think you may have a problem finding your way. Vanjerwadi, Karjat, Raigad Dist. Maharashtra 201. India. Bollywood drives the country crazy, it is one of the biggest industry. When Bollywood shifted to Karjat, this scenic village was on the map of not just directors but also tourists. ND Studio, started in 2005, has become a major stopover for people traveling to Karjat. Red Fort and Jaipur Fort (backdrop for Jodhaa Akbar) and the corporate office block (Lage Raho Munna Bhai). The lavish sets of Jodhaa Akbar became an attraction, the huge fort looked good and it remained there for quite some time after the movie release. ND Studio is a good option for film-making, as the studio offers access to lakes, mountains and sets resembling Mumbai and to that matter many European locations too. Hollywood production houses are also slated to shoot at ND Studio. In October this year, 20th Century Fox plans to shoot its television serial, Walt Disney signed up last year to shoot at the studio for 10 weeks. Actor Michael Douglas is expected to shoot here for his action thriller Racing The Monsoon, and our favorite Johnny Depp will be here for Mira Nair’s Shantaram. A shot in the arm was tying up with Reliance, Anil Dhirubhai Ambani Group, who acquired 50 per cent stake in it. Following which it was rechristened Big ND Studio. The studio proposes to house an amusement park which will be a tour of the Seven Wonders Of The World alongside India’s foremost forts and palaces including the Taj Mahal. It will cost visitors only Rs 999. There are quite a few routes to get to Karjat, its pretty close to Lonavala and Matheran, so the train is a viable option with frequent trains from Victoria Terminus in Bombay as well as Pune. You may like to take a look at the train timings from CST (VT) to Karjat, although it may not be completely accurate. The train journey can take you upto two hours and is quite scenic after Kalyan! If you are getting to Karjat from Mumbai by road, you would need to get to Vashi, then Panvel if you get on the Mumbai Pune Express way then you need to take the first exit on the left its the Shedung Khopoli Exit. The problem with coming by Car is you end up paying three tolls, amounting to Rs.160 for a journey to and fro from Mumbai, but if you decide to bike it, its a fun ride without any toll and you can reach your destination much faster as you avoid the jams at the Toll plazas. The Road journey takes around two and a half hours including some amount of traffic.